This last fortnight seems to have been full with people. We have had a lot of events and a lot of catching up with people. Some planned, some quite unexpected. All great, but it does get challenging to remain focussed on school work. Funeral: My uncle died unexpectedly and it meant a huge day out in Warragul with the burial, luncheon, celebration service and dinner with relatives. Even though it was a sad occasion, it was great to reconnect with cousins, aunts and uncles, great aunts, distant relatives, dad and a brother and sister from Tasmania. I grew up in Tasmania and most of my family still live there, plus heaps of cousins as well. Growing up we used to connect a lot, getting together most Sundays for a picnic. It is now some years since I saw most of these cousins and aunts and uncles so it was great to catch up. It was also good for the kids to meet these people, hear the stories, and play with their second and third cousins. Several great aunts and uncles were there and it has been eleven years since I caught up with them when my mum was still alive. After the funeral, one beautiful great aunt even sent Matey (8) a book she had written based on her father’s war diaries. Her father, Jack Reid was a ‘Coastwatcher’ in the Second World War. He had been a missionary in Papua New Guinea and, during the war, Judy and her mum were sent back to Victoria whilst Great Uncle Jim stayed to help. He has never been officially recognised by the government for his help as he was a Naval Reserve Volunteer, but what he did was dramatic. The Papua New Guineans were faithful to him because of his prior relationship with them as a missionary, thus the information he relayed to the government about the advancement of the Japanese helped protect Australia. Several times he lay on the jungle path, covered in branches with the Japanese walking over the top of him. Matey of course is fascinated in any war stuff, so this present of the book and Uncle Jack’s writings totally engross him. Scripture Union Beach Mission: Our family has applied to join a beach mission over late December, early January. Whilst this will also be hubby and my 25th wedding anniversary over this time, we felt we could celebrate this later in January. We felt it was important to be doing mission here in Australia and this is a great way as a family to be involved. We go camping with the team for ten days in a caravan park. Whilst there, we run programs for children – games, singing, craft, stories, share our faith. We get to know the kids and their parents and form relationships from which we can share about God. Thus, the whole family can be involved. We recognised that the kids are growing so fast and it would be good to start to implement an annual event like this before they become too independent. Thus, we had our first meeting on Sunday afternoon with the rest of the team. They are a great bunch of young adults plus another family and a couple. It will be fantastic doing life with these folk for ten days. Our two children react differently to new things. 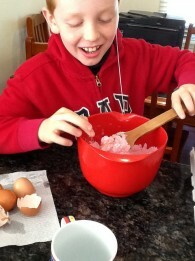 One child is reluctant to try new things but as soon as we step out, that child loves it. The other child charges head first into things and becomes quite passionate and focussed on nitty gritty details. Prophetic activities: The children have been involved in drawing prophetic pictures for a number of folk this last fortnight. I am sometimes amazed at what they draw and how accurate they are, whilst at other times, the drawings are encouraging. Feedback from some folk who have been to the Healing Rooms and received prophetic pictures from the kids and how accurate they are always tends to amaze me. We also had the opportunity at two church services but also a specific prophetic team meeting to meet Bobby and Carolyn Connor from the USA. They spoke to our prophetic team and encouraged us in developing our intimacy with God. Everything depends on our intimacy with God. Everything flows from that. Bobby has some amazing stories and the kids loved hearing them and realising that God is so much bigger and can do so much more than you could ever imagine. Europe study: This last week we have decided to do an overview of Europe in Geography. 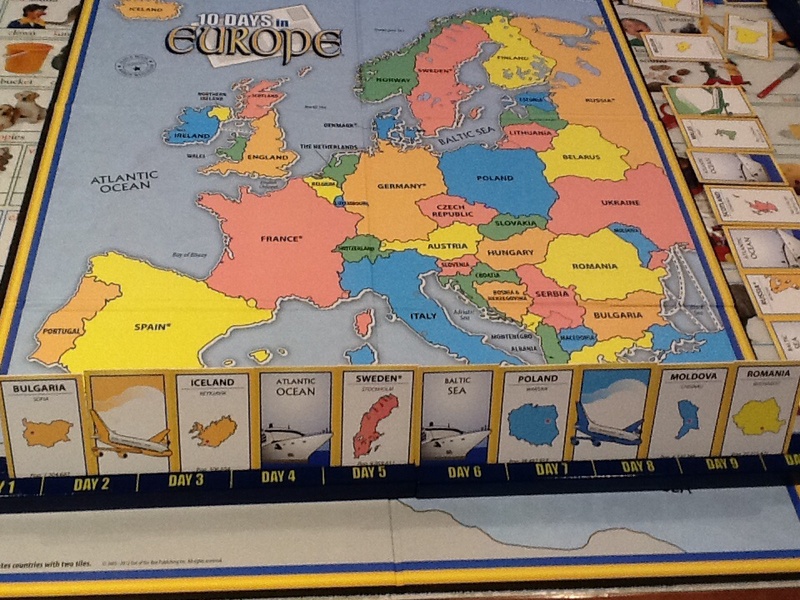 We have several board games that are based on Europe (’10 Days in Europe’ and ‘Ticket to Ride Europe’) and the kids loved playing them. We began by seeing how many countries in Europe we could name on a blank map. At the end of this unit, we will see how many countries we can label then and hopefully notice a huge difference. I am not good myself at knowing all the countries in Europe, their capitals and where they are precisely located. Thus, Princess’ (11) assignment for the week was to make up tour itinerary that lasted for 44 days and went through the 44 different European countries, staying a night in each place in their capital city. She needs to list the countries in the order of travel to each one, their capital city, and their most famous landmarks & points of tourist interest. Meanwhile, Matey and I are trying to learn where all the different countries are. There are several countries I had no idea existed. 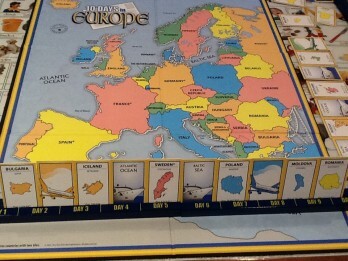 The board game “10 Days in Europe” is basic but great to play. We adjust the rules so it is quicker, otherwise I could imagine it could take ages until you complete it. Basically you draw ten cards and have ten slots to rearrange the cards in so that you can traverse the countries in Europe in an easy manner. You can have countries next to each other if they exist side by side, otherwise you need a boat between them if they are separated by an ocean or sea or a plane if they don’t border each other. On your turn, you can get rid of a card that doesn’t fit and pick another one from the pack. It is a great way to start to learn where the different countries are located. Movies watched: In tying in with our theme of broadly studying Europe, we watched “The Sound of Music”. This is an all time favourite of mine and the kids loved it. The part where Leisl gasps when she sees her boyfriend whilst they are hiding in the convent brought great discussion about what she should have done instead. 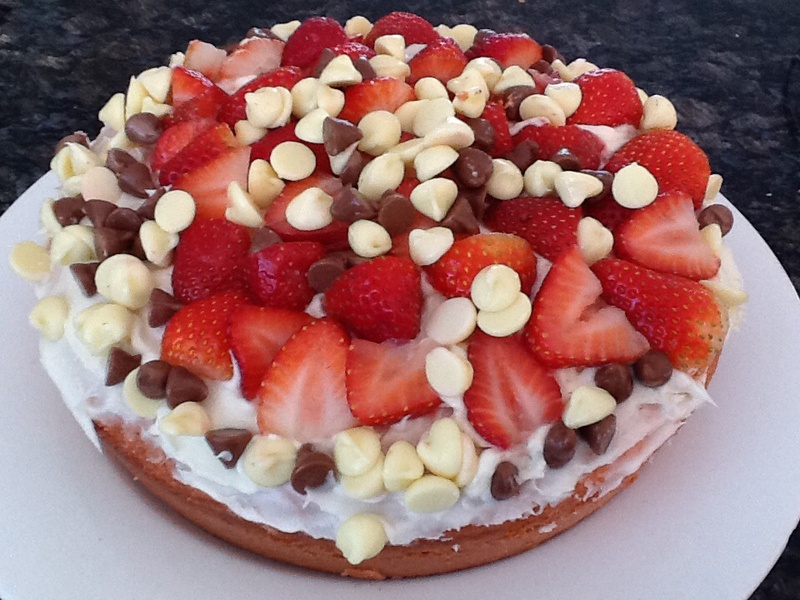 Cooking: This last fortnight held a great achievement for Matey as he managed to cook a cake and ice it all by himself without anyone else’s assistance. 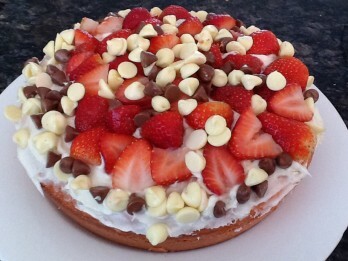 The icing was decorated with oodles of chocolate bits and strawberries, his favourite, but he had made it all by himself. Homeschooling groups: We are part of two different homeschooling groups. We have been a part of one based near Berwick for over a year. This group is comprised mainly of homeschooling families that attend our church. It is a fantastic set up as the children all play together whilst the mums have coffee and then pray for each other. The focus is on the mums being encouraged and filled up and you always come away greatly encouraged. My kids love it as well as there are some great quality teenage girls for Princess to look up to, admire and learn from and a number of boys Matey’s age for him to connect with. This is held one afternoon a month but just right for us as it is over an hour’s drive to get there. The other group has just begun meeting closer to us. Again, it is Christian based and focussed on getting the children to look outside of themselves and serve others. This is the group where we had the missionary speak and we have begun to do the loom bands for her to take to Myanmar. (By the way, we have passed the 200 loom band bracelet mark.) I led it the last time we met and we spent some time creatively praying for different areas of the world, especially the Middle East (Iran, Syria, Israel etc.) and all the conflict over there. We set up 5 different prayer ‘stations’ including a play dough one, another was blowing bubbles, etc to create and release joy, peace, protection etc over these areas. Our next time together will focus on Jewish traditions of the Feast of Trumpets that is coming up. I am very ignorant of these feasts so I am really looking forward to learning a lot. A criticism of our involvement in these groups could well be aimed at us being involved in Christian groups in regard to our homeschooling activities and aren’t we further alienating ourselves from ‘real life’. That is probably a valid observation but when you look at how our children interact as a whole with others, their involvement in community and sporting activities and life in general, there is a greater understanding of why we are doing this. I find that I am very busy during the week as not only do I homeschool, I am also involved in various other things as well. Thus, time can sometimes be an issue. I have come to realise that I need to be selective in which groups I join and look at what our needs are at that particular time and then look at which activity best meets that need. The local homeschool group began with one of the mums having a need and organising a small group based around that. It is a great size with only 6 families involved and that means that the kids can form great friendships. Thankfully for us, there are a number of boys Matey’s age in that group. Lately, one of our prayers has been for Matey to develop good solid friendships with other boys his age who live nearby and who make wise decisions and who won’t lead him down paths of destruction. We can already see God’s hand over his life in visibly protecting him from recent friendships where the boys have been a negative influence and have the potential to make very unwise decisions. These two groups have been great at beginning to help form great friendships with like minded boys, boys who are active, physical and passionate about life. This has been a constant prayer of mine lately and I love how God is already answering it albeit not in the manner I expected. Canoeing: Matey loves adventure and exploring. Lately he has been talking about the possibility of getting a canoe for his birthday. 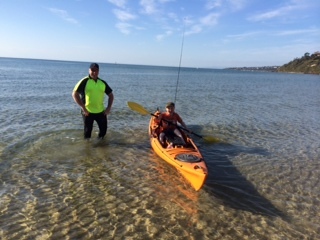 Hubby’s friend goes canoeing down our area a lot so on Saturday, this kind friend helped Matey and showed him how to get in, get out, turn, paddle the canoe and ride waves. They went out in the bay for most of the afternoon and Matey had a fantastic time. The only trouble now is it looks like the canoe is a certain but we need 2 canoes so that hubby can go with him. We love fostering this side to his personality as it is so healthy plus we see this as being something that he will be heavily involved in (exploring and adventure activities) as he gets older. Dance: Princess has spent a huge portion of time this last fortnight composing a dance to the Happy” song by Pharrell Williams. She has perfected the moves so that a group of her friends can do it. It has been great to see her commitment to this and the work she has put in. I must confess though, I am thoroughly sick of the song!! I hope you have also had a great time connecting in various different ways with your own children this last fortnight.